San Francisco is a compact city, where you can see a whirlwind of highlights in a day if you have limited time (through it’s recommended that you spend at least 5 days to get a feel for the city). For an ideal one day in San Francisco, it’s important to see a mix of sights around the city and not just limit yourself to the touristy areas like Fisherman’s Wharf and Chinatown, to get a better feel of what this city has to offer. Before we get into the itinerary, here are a few notes on some common questions that people have before visiting the City by the Bay. Homelessness throughout the city is unfortunately a major issue and can be quite disheartening to witness. Many homeless individuals struggle with mental issues, and/or drug addictions. If you respect their space, they will respect yours. If you’re curious about organizations that help the homeless, St. Anthony’s, Glide Memorial, and Raphael House are a few great places to start. How safe is San Francisco? Another common concern visitors have when they come to SF is how safe is the city? Like any mid-sized city there are parts that you should be extra vigilant in, especially during the night, including the following areas: Tenderloin, Civic Center, parts of the Mission (stay west of Mission Street), Western Addition, and areas of SOMA (around 6th and Mission). Bring a warm jacket no matter the time of the year. Typical seasons? SF doesn’t follow the rules. It can be sunny in the morning, but then the fog can roll on in during the afternoon. Or it can be foggy all day. Karl The Fog seriously has a mind of his own (and his own Twitter account). The general rule through is that the closer to the ocean you are the foggier it will be. It can be warm in the Mission, but freezing in the Sunset. True story. Alright, now that we got that out of the way, let’s get on to the fun stuff shall we? Start out your morning brunching the way locals do-with a delicious dim sum feast. This restaurant is more upscale and is a nice change from the slightly chaotic dim sum carts at other spots, where instead you order by marking your choices on a piece of paper beforehand. All the classics like shrimp dumplings, pork buns, and egg tarts are on the menu, as well as fried noodle and veggies dishes. Make sure to line up right before 10:30am to try and beat the rush. Afterwards, head over to the city’s largest park to walk off brunch. Start out at the de Young’s Hamon Tower, where you can get a 360 aerial view of the park and the city and ocean beyond, especially if the fog lifts. The entrance to the tower is free, and is separate from a museum entrance ticket. Afterward, walk across the way, to the California Academy of Sciences, which is an innovative natural history museum with a live rainforest, a living eco-roof and an impressive 75-foot dome planetarium. Spend the afternoon in Crissy Field, where you are treated to one of the best views of the Golden Gate Bridge and the bay. This restored marshland is the perfect place to walk along the water and people/dog watch. Make sure to bring a jacket, since it can get windy and/or foggy near the water. 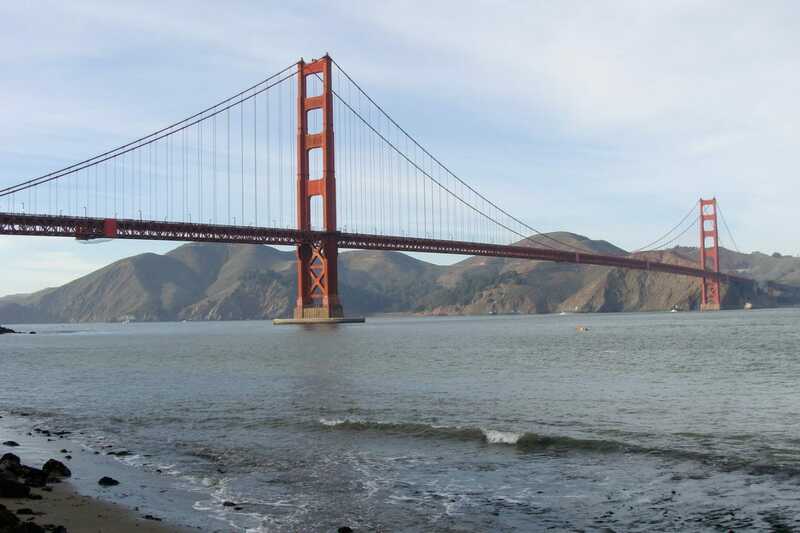 A great place to go is Crissy Field East Beach, where there are plenty of postcard perfect views of the bridge. If you want to get close and personal, the walking path from the Warming Hut to Fort Point brings you right up to the base of the bridge. From Crissy Field, head to Fisherman’s Wharf, where you can see sights like Ghirardelli Square (a real-life chocolate factory), and the Musee Mecanique (a personal favorite since childhood), which features penny arcade games. Afterward, take the streetcar or walk to Pier 39, and see the noisy, but lovable sea lions. Walk along the boardwalk and browse the shops, and admire the historic carousel in the center that includes beautiful hand-painted panels of famous SF landmarks. If you have the time (and energy), you can take an Uber to one of the oldest Chinatowns in the U.S. Start at the Dragon Gate, and wander along Grant Avenue with the colorful lanterns, and numerous souvenir shops. Sample tea at Vital Tea Leaf, where you can do tastings with no pressure to buy anything. For a little pre-dinner snack, stop by the iconic Eastern Bakery, that has been here since the 1920s and has had presidential visitors like Bill Clinton stop by for their famous egg tarts. Cash only. For dinner, head to North Beach, the city’s historic Italian neighborhood, and snag a spot at the uber popular Tony’s Pizza Napoletana for memorable pies and lively atmosphere. For dessert, Stella Pastry & Cafe, an old school bakery is the place to go for a dizzying array of Italian cookies, cakes, and cannolis. Walk down Columbus and stop in City Lights (open until midnight every day) which is known for its progressive views, including publishing the controversial Allen Ginsberg poem Howl. Save downtown for the finale, where you can wander around the city square and admire all the lit up department stores like Macy’s and Neiman Marcus. Head up to one of the top levels of the Macy’s department store, and be treated to an aerial view of Union Square from one of the many windows. Afterward, walk along busy Powell Street, and end the night at the glitzy Westfield Mall. San Francisco can be quite pricey when it comes to finding accommodations, especially if there’s a huge tech conference or concert (Outside Lands) that takes over the city. That being said, there are reasonable options, especially if you go in the spring or late fall. It’s harder to get more central than this, with Pier 39, Fisherman’s Wharf, Ghiradelli’s Square, and the Alcatraz ferry within walking distance of your room. A quick cable car ride away is Union Square and Chinatown. Amenities include: clean, spacious rooms and a twenty-four hour diner on-site. Great downtown location that is a 15-minute walk to Union Square and a 20-minute walk to the Embarcadero and the waterfront. Other nearby highlights include the SF MOMA and Yerba Buena Gardens. This hotel is less than a 10-minute walk to the Montgomery BART station, which goes straight to the airport and other popular destinations. For the ultimate SF getaway, stay in this historic hotel located in Nob Hill, right on the edge of downtown. The property is walking distance to Union Square, Chinatown, and a quick cable car ride to Pier 39. Whether you’re a guest or not, drop by the legendary Tonga Room and the life-sized gingerbread house if you’re there for the holidays. What is on your ideal one day in San Francisco itinerary?